Vancouver Canucks winger Alex Burrows gets a free pass today. He can gloat, brag, boast and holler all he wants after netting his second hat trick in as many games to help lift the streaking Canucks into a virtual tie for first place in the Northwest Division. Of course, Burrows is choosing to do none of the above. Instead, he's trying to downplay his back-to-back hat tricks, which may even be harder to do than scoring them. After all, he's the first guy to accomplish this feat since Ilya Kovalchuk did it three Novembers ago. He's the first Canuck to do it since Petri Skriko in 1986. 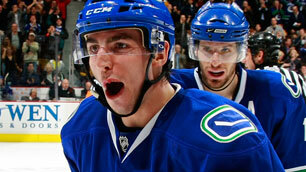 "Finally getting some bounces," Burrows politely and somewhat shyly told NHL.com Friday. Burrows is hardly playing along here, but he's not lying either. Burrows went nine-straight games without a goal to end 2009 and he was snakebitten. Each of Burrows' last 6 goals have come from within 10 feet of the goal. He's scoring by driving the net. He's scoring by finding loose pucks. He's scoring by finding open ice. He even scored his first shorthanded goal of the season Tuesday against Columbus. "It's kind of a weird feeling," Burrows said when pressed to describe exactly what it feels like to score back-to-back hat tricks, something that's been done only twice previously in Canucks' history. "The first one kind of felt like everything was going in and even (Thursday) night I don't think I did anything different than I did in the previous 10 games. I just tried to get my shots through and for some reason they are finding ways to beat goalies and hit the back of the net. It's fun." Who wouldn't have a blast playing on the same line as Henrik and Daniel Sedin? Burrows gets to be that guy and he knows what it's done for his career. He scored 28 goals last season playing mostly with the Swedish twins. His previous career high was 12 the season before when he was mostly a checker for the Canucks. A couple years before that he was toiling in the ECHL. After his recent stretch of good fortunate (as he likes to say), Burrows now has 17 goals this season, including 13 since Daniel Sedin returned from injury on Nov. 22. This is no small coincidence, folks. A twin has had a hand in each of Burrows' 13 goals since Daniel returned. Henrik and Daniel have combined to assist on 10 of them. 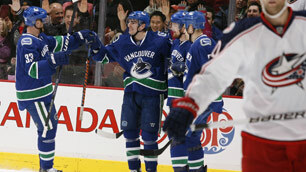 Only Ryan Kesler, Sami Salo and Shane O'Brien also boast an assist on a Burrows goal in the last month and a half. 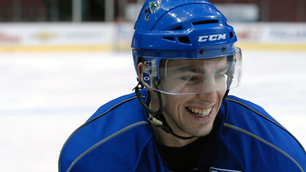 All Burrows has to do is play his game by driving the net and finding open space and he's bound to get opportunities. Putting them in is a different story, and that's totally a credit to him even if he won't take much of it. "They are such smart players that they are going to make plays offensively," Burrows said of the million dollar twins. "We try to read off each other on the forecheck. When they tell me we're going to try some trick plays I just go with it and do the best I can." Prior to Daniel's return from his broken foot, Burrows had only five goals. He scored only twice in the 18 games Daniel missed, including a stretch of 11 straight without one. Daniel's absence absolutely hurt Burrows. He didn't have a home anymore. "We kind of went through a lot of line changes and shuffled the lines a whole lot trying to find the right chemistry while Danny was out," Burrows said. "I played a few with Hank and moved with other guys and same for Hank. We were both all over the place and still trying to win games and do the best for the team. Now that Daniel is back, Alain (Vigneault) put us back together and it has been working great." Burrows doesn't only credit the twins for the bulk of his production. He said he feeds off of their patience and calm demeanors. It got him through his recent nine-game goal scoring drought. "I try to stay positive and know things are going to come around so I do the same things every day and hope for the best," Burrows said. "That's one of the things Daniel and Henrik do well. You never see them get too excited or down on themselves. They are always the same guys. You wouldn't be able to tell if they were on a 10-game point streak or if they hadn't scored in 10 games." Maybe that's why Burrows was downplaying his back-to-back hat tricks when we talked to him Friday. He knows the hot stick can cool off as quickly as it heats up, but for one day he should stand up and take a bow. Alex, you've earned that much. "I have a lot of buddies texting me and congratulating me about it," he said. "It has only been done by two players in Canucks' history, so I know it's big, but I just feel finally the bounces are going my way instead of going the other way."